Hello Friends, Happy Monday, Happy Week and Happy October!!! A few months ago, I shared with you some tips on making pinwheel blocks here. Well, that’s because I was making pinwheel blocks upon pinwheel blocks for a while there for the two following pinwheel projects. :) It truly is amazing to me how a simple unit, when used differently, can create totally different looks. I think that’s what appeals to me in designing quilts. I love to see what I can do with simple quilt blocks. Pinwheel Parade is made with Windham Fabrics’ Chambray Rose. I enjoyed quilting this quilt — and here are a few pictures. 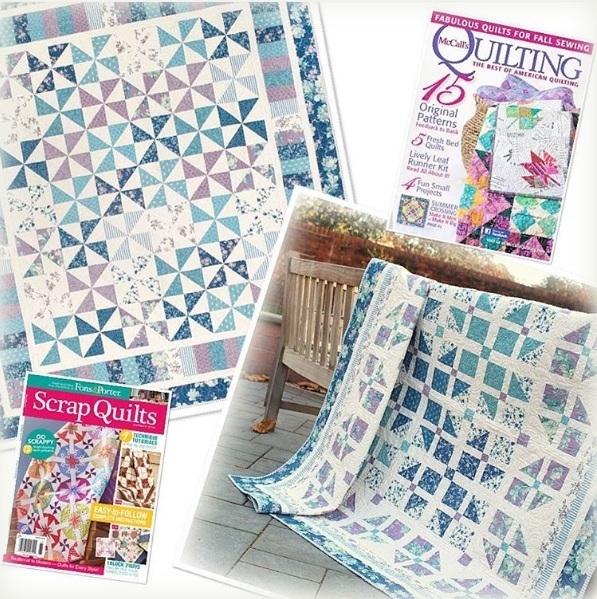 You may recall I had another editorial feature in McCall’s Quilting last year using the same Chambray Rose fabrics. A special thank you to my dear friend Darlene Szabo of Sewing Graceful Quilting for quilting the quilt for me. 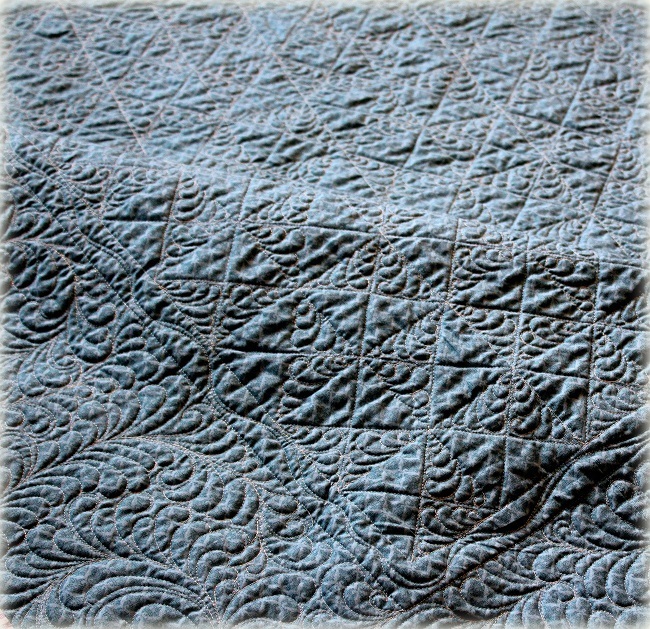 Winter Wind is made with fabrics from Quilting Treasures‘ Canterbury line – elegant & masculine & timeless! Exclusive kits are available for a limited time here. That’s all for now, Friends! Lots more to come…. but lots more to do as well, so I’d better fly for now! Hugs to you all. Note: You may click here for the exhaustive list of my published work. 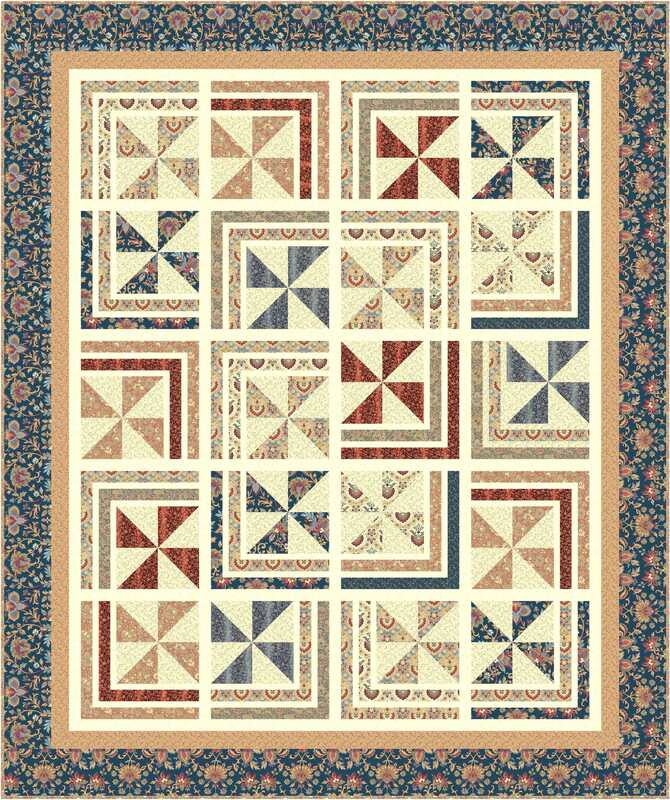 This entry was posted in Quilt kit, Quilt Pattern, Quilting, Quilts & Projects: Published, Quilts: Pieced and tagged Fons and Porter Scrap Quilts Summer 2016, McCall's Quilting November/December 2016, Pinwheel Quilts, Quilting Treasures, Wendy Sheppard Designs, Windham Fabrics. Bookmark the permalink. daughter can watch your progress and then create delightful stitcheries of her own. 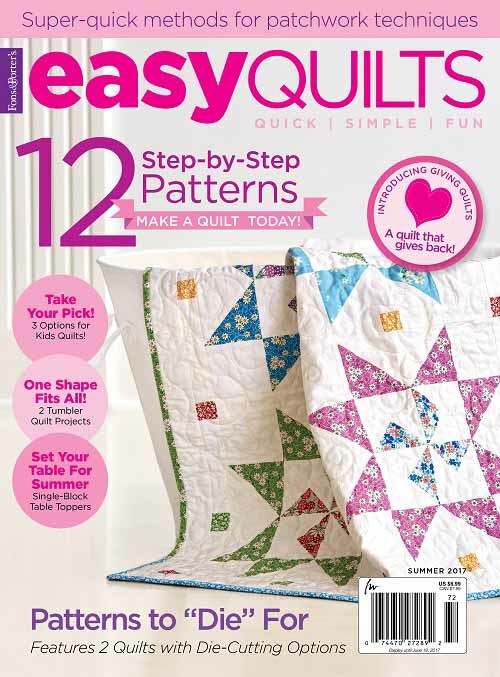 I love pinwheels and your quilts so thanks for the chance to win the magazines. Congrats on both features! 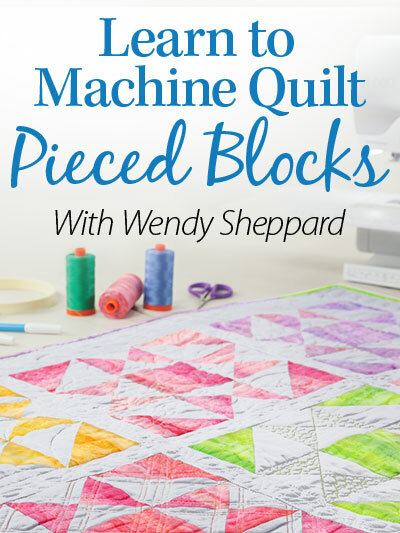 I also love pinwheel blocks, and your quilts and fabric choices are really pretty. I sure saw a lot of quilts in Amish country and thought of you a lot! 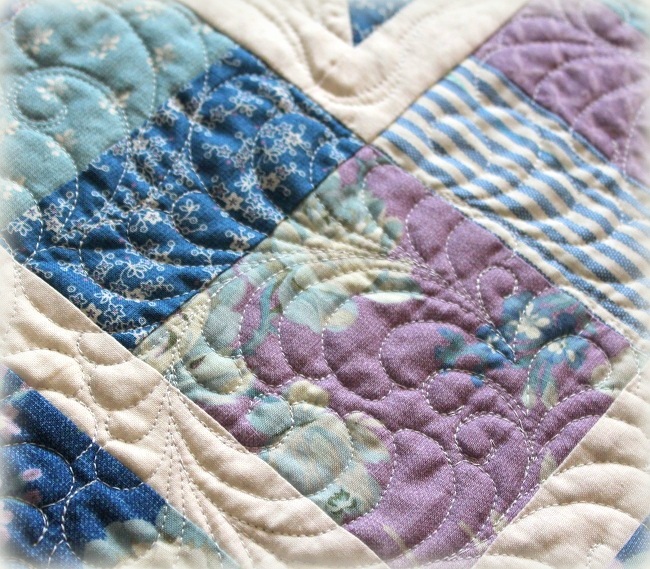 Beautiful piecing, quilting and photography! 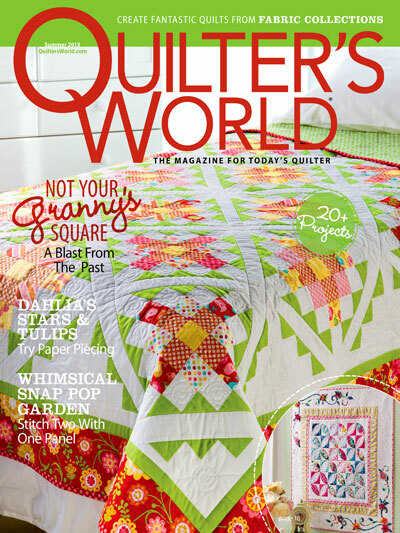 Your quilts are beautiful as usual, Wendy, and I have feather envy!! My SIL just made a queen size quilt for herself using the Chambrey Rose line – lovely fabrics. She did a bit of a ‘twist’ to the pinwheel to make it her own. 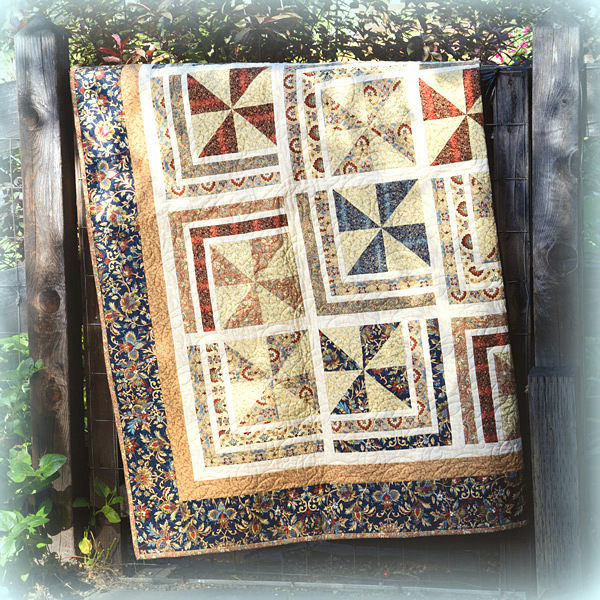 Love the half framed pinnie block – what fun laying out a design with this. I enjoy making pinwheels. 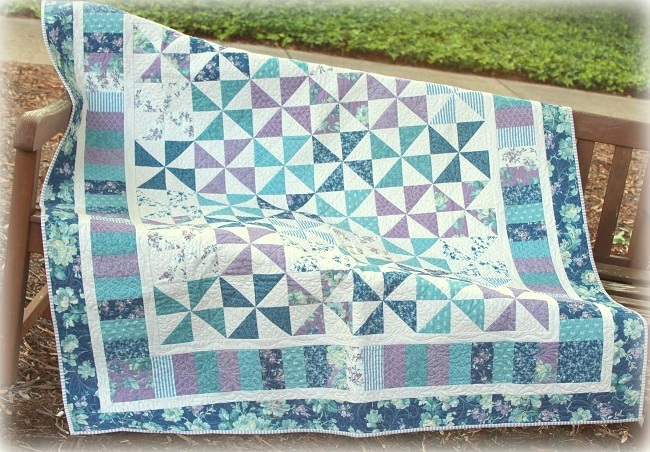 Quilts with pinwheel blocks make me think of summer days and playing with pinwheels. Your creations are all lovely. Your quilts are stunning, as always! I particularly like Winter Winds, and would love a copy of the magazine! 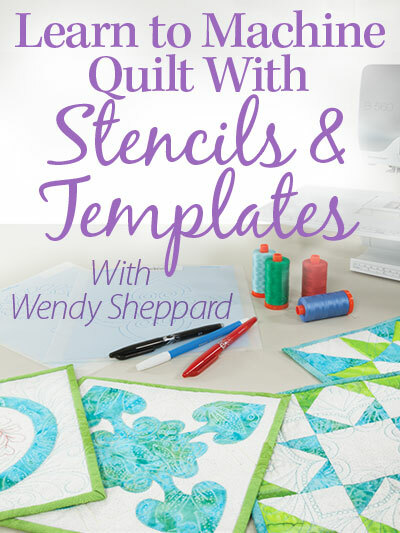 Fun quilts and fabulous quilting as always, Wendy! yes, please Love scrappy and pinwheels! You are a very gifted quilt designer. 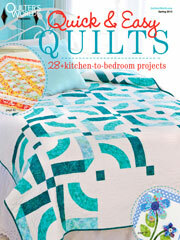 I have already made two of the quilts you have designed and have my eye on several more. 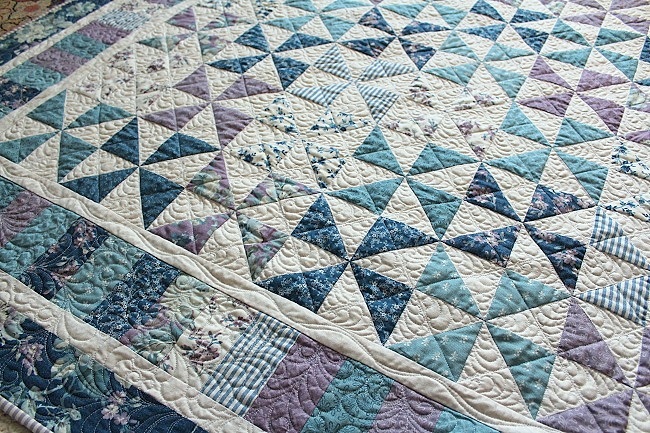 I just love the way your quilt designs ‘flow’ and have movement. My favourite medium is scraps. 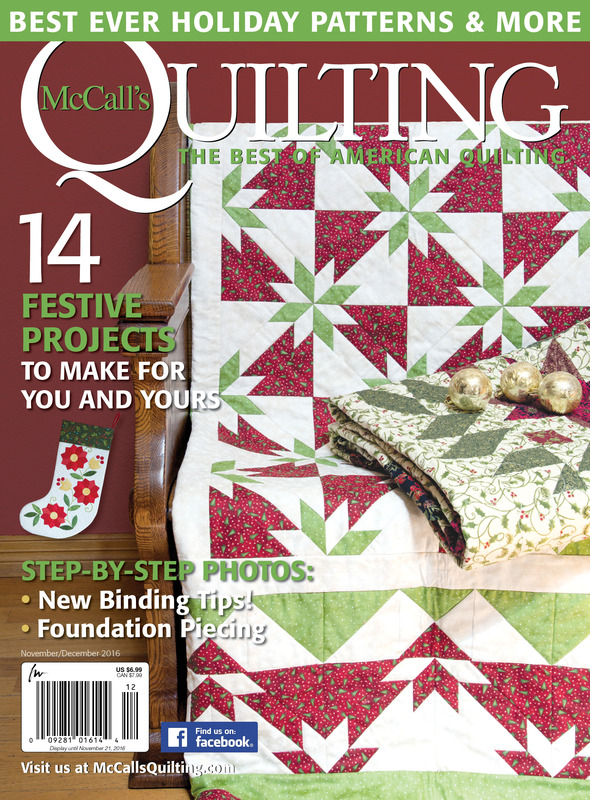 I’d love to have these magazines with your beautiful quilts in them. They are both gorgeous!! Some of my favorite magazines. I truly enjoy reading your blog and you make Friday SEW exciting! I’d love to have a copy. Pinwheels are my go block. Great quilt. I really like McCall’s and would like to win a copy of the magazine. Thanks. I just read thru your tips on pinwheels, and will press the seams open the next time I make a pinwheel. I press seams open when making lone star strips, but didn’t think of doing it for a HST. So glad you always share what works best for you. One beautiful quilt after another. You have a great talent, Wendy. Pinwheels are so easy , but always give a quilt a fun look. I even love the 3D ones. Both new quilts are great! Pinwheels are so much fun! I’ve made so many pinwheels in my quilting life. I love the look. Thanks for the giveaway. I really love how the offset frames around the pinwheels make them seem to float! Great design! I don’t know how your mind can design so many different quilt patterns and I love every one of them. Don’t stop! I have been a fan of your work for many years. This is my first post. You have a wonderful eye for taking the simple designs and creating fresh new looks. 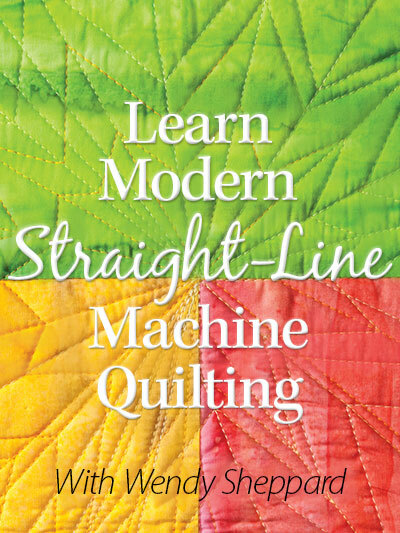 I also enjoy your machine quilting, you have inspired me time and time again. Thank you! 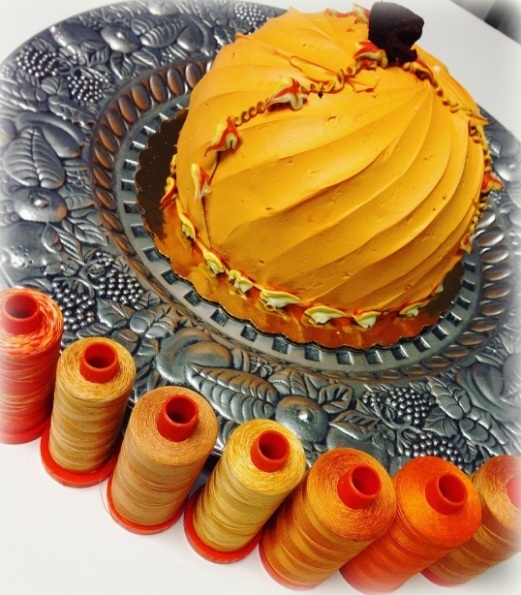 I love how the pinwheels are bordered by….MORE PINWHEELS! Love your designs! 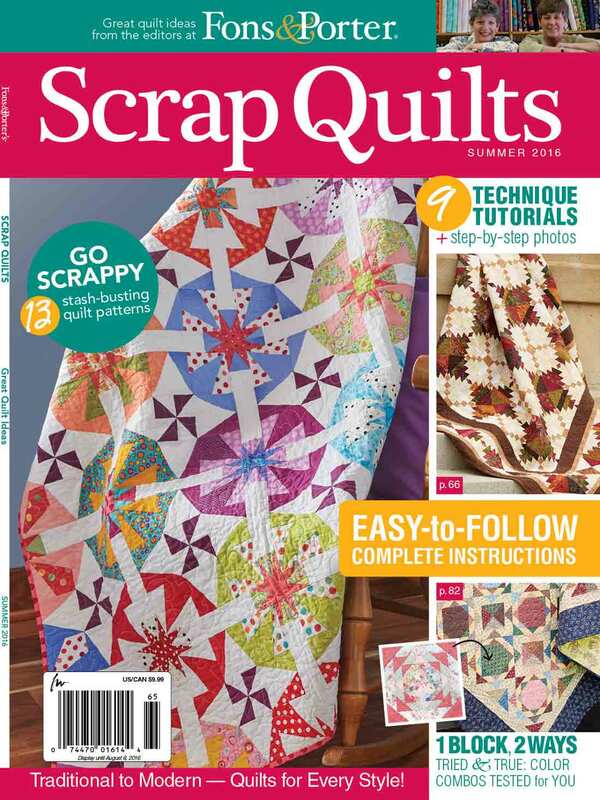 I just love the quilt on the cover of “Scrap Quilts” so alive looking and bright… definitely want to get this magazine!! Great job! !